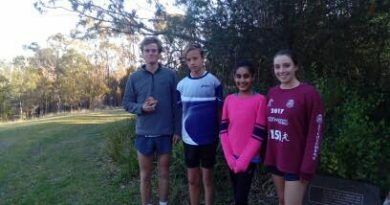 Round 1 of the 2018 Cross Country season was held at the traditional Jells Park with junior athletes completing one lap of the 3km course. The conditions were good being sunny and the grass was ideal underfoot which meant fast times. There was 1 U14 team and 2 U16 teams. The under 14 team of Dilan, James and William ran strongly for 6th place with Dilan running 10.51, James running 11.11 and William ran 12.50. The U16 team of Nick, Noah and Thomas placed 13th while the other U16 team of Hugh, Kye and Elias placed 4th. Nick ran 11.29, Thomas ran 13.54, Noah ran 13.42, Hugh ran 10.21, Kye ran 10.41 and Elias ran 10.57. 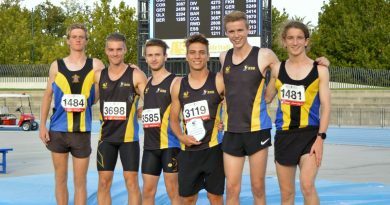 U20 athlete Izaak Long ran the 6km distance in 39.55 for the Division 7 team. The second round of Cross Country for the year was held at the new course of St. Anne’s Winery in Myrniong. The hilly course made the day challenging with U20 and U18 athletes running 2 laps of the 2km course, the U16 athletes running one laps of the 3km course and U14s did one lap of the 2km course. For the U20 Izaak placed 30th in a time of 25.59. In the U16 Hugh placed 8th running 10.46, Kye placed 19th running 11.22 and Elias placed 25th running 12.07. In the U14 Dilan placed 7th running 7.22, James placed 10h running 7.42, William placed 20th running 8.26 and Noah and Thomas running 22nd and 23rd in times of 9.14. 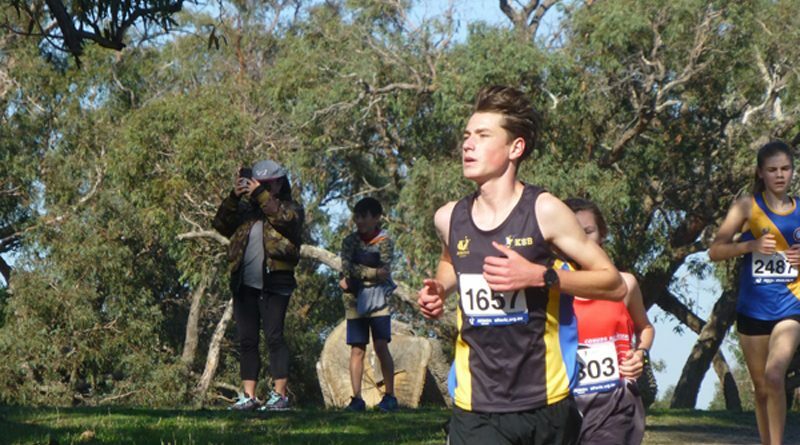 Round 3 of the XCR Season athletes travelled to Cruden Farm in Langwarrin for the Heritage round. The conditions were close to perfect not raining or being cold with the sun coming out. The U14 athletes competed over the 4km distance with William finishing 16th in a time of 18.15, Thomas placed 20th in 20.43 and Callum came 21st in 24.33. The U20 and U16 athletes ran together doing on lap of the 4km course and one lap of the 2km course. In the U20s Izaak came 30th in 39.37 while in the U16 Hugh came 17th in 21.55 and Ky came 28th in 23.43. 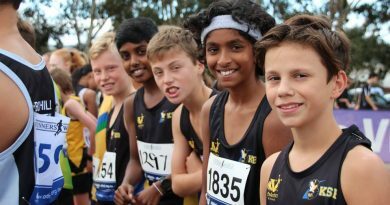 Round 4 of Athletics Victoria Cross Country was held in conjunction with the Victorian All Schools Championships. Junior athletes ran for their school except for U20 athletes. In the U15 age group Kye came placed 35th in a time of 14.27 for the 4km distance. Nick placed 45th in the U15 age group, completing the 4km distance in 15.13. In the U18 age group Jacob ran the 6km course in 20.04 to place 16th In the U20 age group Izaak placed 28th running the 8km distance in 54.29. The second relay event for the season was held at Sandown Racecourse. The weather forecast was not looking pretty before the event with rain and strong winds predicted. Thankfully we didn’t get any rain but we got strong winds, which you could really feel on the back side of the course and athletes were running into it for the rest of the race. 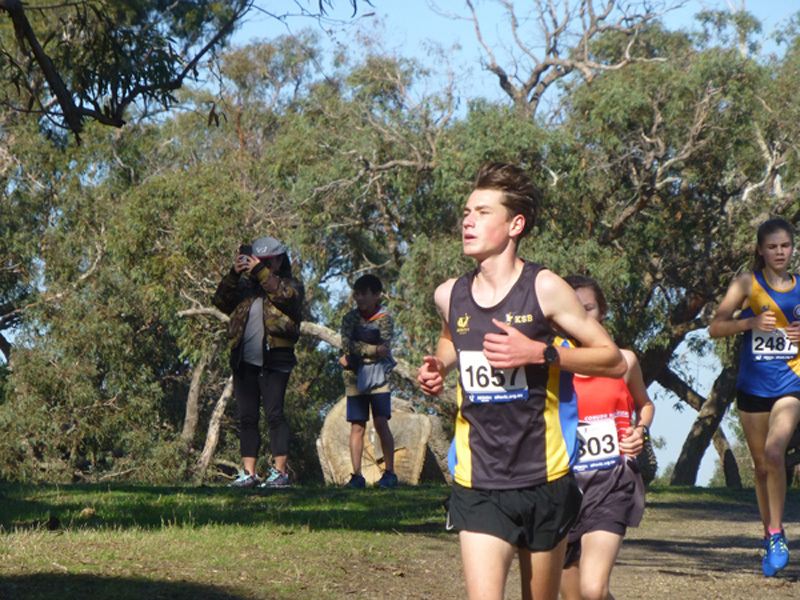 U18 athlete Jacob Bell ran in the Division 2 senior Men’s team completing his 3.1km distance in 10.28. 2 x U20 athletes ran to makeup a team in Senior Men’s Division 7. Samatar ran his leg in 11.18 and Izaak ran his leg in 17.30. The U16 team of Hugh, Elias and Kye placed 8th with Hugh running his leg in 10.22, Elias running his leg in 11.44 and Kye finishing off strong for 11.23. In the U14s there were only 2 runners with Dilan running 11.36 and William running 13.08. The first Sunday morning Cross Country race for the year athletes made their way to Lakeside Stadium, Albert Park. Athletes ran on Albert Rd and Lakeside Dr with the U18 and U20s doing 10km while the U14s and 16s ran 3km. The 10km distance was 2.5km out and back twice while the 3km course was 1.5km out and back finishing in the back straight of Lakeside Stadium. In the U20 age group Izaak placed 28th running 63.08. In the U18 age group Jacob ran 37.01 for 16th place. In the U16 age group Hugh ran 9.22 for 5th place while Kye ran 10.36 for 21st. For XCR Rd 7 athletes competed at Lake Wendouree, Ballarat. All of the juniors completed one lap of the lake which was 6km. The conditions were cold but could have been a lot worse. The runners started off with no breeze but roughly 2km in the wind picked up. This wasn’t too bad at the time because it was a tail wind but towards the end it made the finish very difficult. In the U14s Dilan crossed the line for 7th with James not far behind him. Dilan ended up running 22.57 while James ran 24.12. In the U16s Hugh ran 20.57 for 6th and Kye ran 22.47 for 15th. In the U18s Jacob finished 8th in a time of 20.12. In the U20s Izaak finished 19th for a time of 36.51.